Our data recovery process is 100% financially risk free. We only charge if the data you want is successfully recovered. We know data loss can be a very difficult experience. That’s why we want to make it as easy as possible for you to get your important files back. With industry leading success rates, data recovery experts with over 100,000 hours of combined data recovery experience, prices 40-50% lower than our competition and cutting edge engineering techniques, you can see why we’re trusted data recovery partners for many organizations. Using advanced engineering techniques, we can recover data from large capacity, enterprise grade storage devices such as RAID arrays, network attached storage (NAS) devices and storage area network (SAN) devices all the way down to your everyday consumer storage media such as USB flash drives and Micro SD cards. ​Our entire data recovery process can be handled to meet HIPAA and PCI requirements for encryption, transfer and protection of e-PHI. Your data is always in good hands and under the most secure encryption in the industry. You can never have too many copies of your data. Our data recovery service is useful, but unnecessary when you take the appropriate precautions. 1 year warranty on all parts and accessories. All labor charges are final. Extended warranties available. Cost of parts may be required up front. A 20% restock fee of the retail price of the parts may be deducted from deposit if repair/order is cancelled. ​All pricing subject to change without notice. 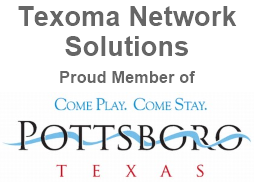 ©2019 Texoma Network Solutions, LLC. All Rights Reserved. All trademarks, trade names or company names referenced are used for identification purposes only and are the property of their respective owners.